There is no doubt that as of this time, the overwhelming favorite to win the crown is none other than the friendly and lovely Chanel Olive Thomas of the Philippines. This statuesque Filipino-Australian has improved a lot since her first national pageant where she won as Miss Philippines Air 2015. Now, the pressure is on her to score a better placement than her three predecessors, who all stopped in the Top 20/25 spot in their respective year. Will we see a jubilant Filipino celebration on December 1st through Chanel? In close second is Martha Martinez of Colombia, who looks like a major bombshell in her glam shots. If Miss Supranational is looking for a Victoria’s Secret model type of beauty, Martha is the perfect queen this year! 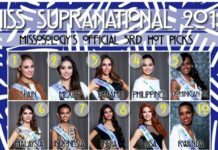 At third place is the Japanese delegate who was crowned, no less, by the reigning Miss Supranational 2016 Srinidhi Shetty in Saitama City last May. Yuki Koshikawa has charmed a lot of fans who consider her to be the prettiest Big 5 beauty queen from Japan this year. Meanwhile at fourth place is Samantha Leyva, who is an extremely tall mulatta from Acapulco. 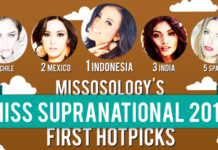 This headturner may just become the first woman of color to win the Miss Supranational crown. And to complete our Top 5 is Thailand’s very own Jiraprapa Boonnuang, who is a product of what is arguably the biggest national pageant to crown a lone Miss Supranational delegate to date. Tereza Vlčková of the Czech Republic is the first Czech beauty to be crowned on stage via the Ceska Miss pageant. Nicole Menayo of Costa Rica is in seventh place, and has this youthful glow on her. Karina Nadila Niab of Indonesia might have a short frame but she is extremely photogenic and has legions of fans back in her country. Habiba Ingabire is an exotic beauty who is currently the leading contender from Sub-Saharan Africa. Michaela Cmarková, the Slovak rep who will share the hosting rights of this year’s pageant completes our Top 10. India is sending this year an interesting beauty from Sikkim. Mauritius has a well-prepared delegate. Bolivia is sending a pageant veteran so we expect her to do well in the various activities. Ecuador will certainly not go unnoticed with her amazing body. China is also sending a top beauty this year, but we need to know more of her in the coming days. What do you think of our hot picks? Post your comments below for reference in our next hot picks! Joie Serrano , Ms. Megaverse Australia 2017. I love goofing around, so some people think I am a flighty type of person. Those closest to me though know that behind my public persona is a tough mind, a strong back and a gentle heart.